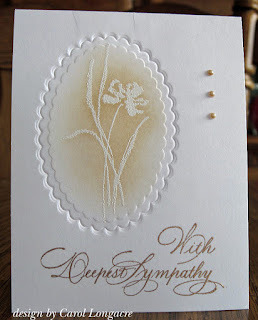 There's a new challenge at Simon Says Stamp and this week it's to make a sympathy or thinking of you card. I made a very CAS card that took little to no time at all to make. I embossed a SB oval die onto my card stock, then stamped the SU! Love & Sympathy image with versamark and embossed it with white ep. I sponged around the image with antique linen ink, and gold embossed the sentiment. I added 3 tiny champagne pearls for the finishing touch. We're bracing for yet another storm with winds, rain, and S.N.O.W here in SE PA. Hopefully we won't lose power again so soon, but there's no fighting Mother Nature if she decides to turn out the lights :) If I'm quiet for a while, you'll know why! Thanks for stopping by and take care! This is so pretty! Thanks for playing along with us over at Simon Says Stamp Challenge blog! Over the top gorgeous!!! Love the font on that sentiment too. Take care!!! Hopefully it won't be so bad you lose power again! Will be thinking about you! Beautiful card Carol, gorgeous swirly sentiment. Thank you for your lovely comment on my blog and thank you for joining us over at Simon Says Challenge. Gorgeous! So elegant. TFS and take care. I hate to have to make these types of card, but this one you have come up with will most definitely lift someone's spirits at the time of loss. I love how you embossed into the card front and your little gold gems add just the right amount of bling. Hope you don't lose power. Right now we have about a 1/2 inch of snow and the wind is blowing but still power, Thank goodness for small favors. So pretty, Carol. I love the embossed oval and the pretty wet embossed image and sponging to pop it out. What a gorgeous font on your sentiment. Oh, I hope the storm isn't so bad this time. You're right, though, no fighting Mother Nature. Stay safe. Hi Carol, such a beautiful card, I love the imageold and soft gentle colours, your stamped sentiment is perfect!! and thanks so much for joining us with Simon Says Stamp challenge. We were very lucky with this storm! I just adore this CAS sympathy. The font of your sentiment is exquisite! Beautiful card, Carol, and great embossing. Another pretty embossed card. 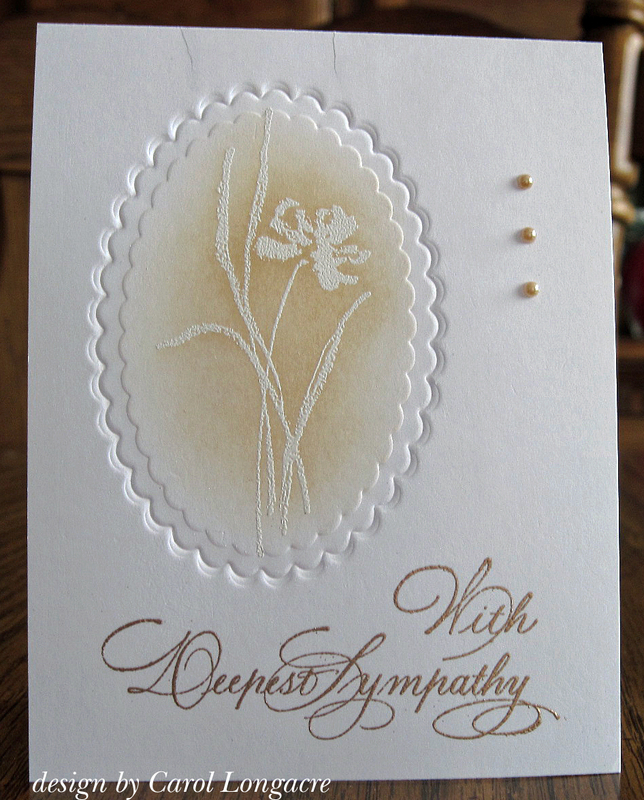 Wonderful sympathy card!